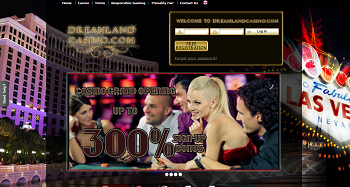 Online gamers may not recognise Dreamland Casino so much, and with good reason. It’s actually only been available to play at since the end of 2014 However, even though it’s still one of the newer platforms to the world of online casino gaming, it’s already looking to make great strides in the industry, thanks to its intriguing website and overall appeal. Not only that, but it’s a casino which is completely dedicated to providing games to those players who enjoy utilising Bitcoins as their preferred method of depositing into their accounts. Initially, this was the only method available to make deposits with. However, since that time, there have been a few other payment methods integrated into the site alongside. 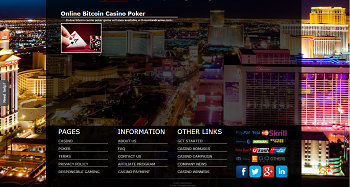 As soon as you load up the website, you’re instantly given the imagery of the king of casino lands, Las Vegas. Bright lights, huge cityscapes and everything in between can be seen in the background, while the layout of the main page is constructed so as to enable simple navigation for its users. 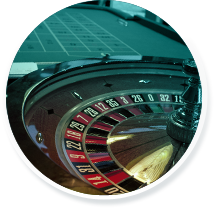 There’s a banner across the top of the site, advertising various different features of the casino, such as the latest slot games and the welcome bonus offer. Below this you can see some of the most popular and featured games to access, while further information about the site itself is displayed at the bottom of the platform. So, if you’re ready for a casino filled with the bright lights of Vegas, this one should definitely be your next stop. An online casino just wouldn’t be the same without offering its players some form of promotion, especially when you’re a newcomer. Dreamland Casino can certainly join the vast group of platforms which do this, and it all begins with the first deposit bonus, which is obviously only available to those players who are first timers. The bonus itself is 100% on top of your initial deposit there, and the only thing that you need to do in order to receive this is use the bonus code, ‘First’ when making the transfer. Following on from this, for every deposit you make after that one, you’ll be rewarded with 30% on top if you use the bonus code, ‘Deposit’ in the necessary spot on the page. This is available to every player making a Bitcoin deposit on the site. In addition this, there are two other ongoing promotions which can be taken advantage of. The first of these is the ‘Casino Cashback Program’. This is awarded manually to every registered player, and you’ll be given 11 casino points for every 100 points. In order to have the chance of withdrawing this bonus, you will need to meet the criteria of a 10 times wagering requirement, and to claim it in the first place, you will need to email the relevant department. And finally, there are ‘VIP Points’ available at this platform as well. These are provided to you at every increase in your total bet amount. They are automatically added to your account in proportion to your total bet amounts, and for every 100 points of bets made, you receive one VIP point. As mentioned, Bitcoins were the original and only method of being able to fund your account, and this particular option is still something that the platform highly pushes as being the best way to deposit. However, in recent months, they casino has begun to accept other forms of transferring funds into your account, such as eWallets like Skrill and NETeller. Visa and MasterCard are also accepted on the site, as is WebMoney, PayPal, UnionPay and Western Union. So, all in all, the site is catering to a variety of different gamers who have their own payment preferences. As far as receiving help goes, if you should ever need this, you can speak to an agent via the live chat on the site. This can be found on the left hand side of the platform. Otherwise, you’ll need to send an email to [email protected], or fill in the form which is available on the website and wait for a reply. 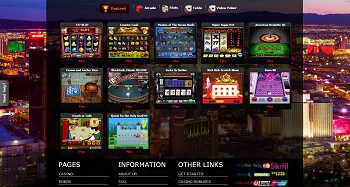 The website is fully powered by CasinoWebScripts, and this is where the available games come from as well. While the games provided aren’t specifically of low quality or considered bad in any way, the platform would benefit more from opening up its incorporated software so as to allow products from other developers to be added as well. Because of its games coming from a single provider, there are limited products on offer for the moment. Whereas most online casinos have a huge amount of slot games, Dreamland is only able to offer four of these in the form of one of each of 3-reel, 5-reel, 7-reel and 9-reel offerings. Four arcade games are also offered in the form of scratch cards and keno, while three casino games have also been made available as well. There’s also a single video poker option added to the site in the form of ‘Jacks or Better’, and altogether, these make up the available products of this site. It’s not a huge amount on the whole, which is a bit disappointing for a casino with such promise, but this does have the chance of changing around in the future, if room is made for games from other providers. We’re really unsure on Dreamland Casino. It has its good points like the variety of depositing methods and appealing platform layout, but the fact that it has so few games is a huge downfall for us. Perhaps if and/or when they fill out their games section, we’ll be more impressed.